Batteries are now getting paired with hydropower, wind, solar and gas. Battery storage is breaking into an ever longer list of grid-scale configurations, as new business cases arise. Every major solar developer has begun at least contemplating storage paired with solar, even if few large projects have yet been built. 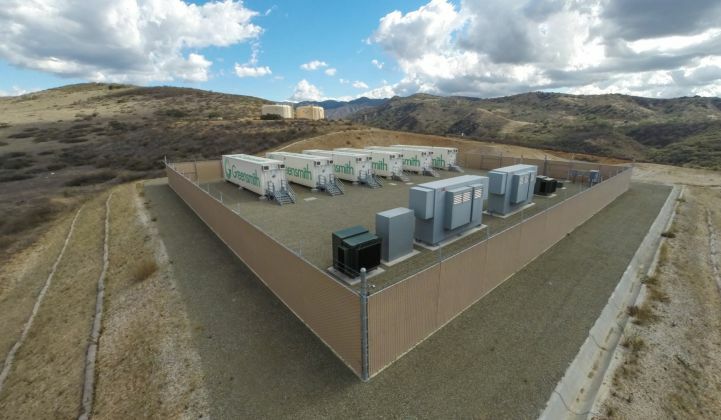 GE has already paired batteries with its gas generators for fast-ramping grid services; it expects the setup to prolong the life of the gas asset. Last week the roster of possibilities expanded when two companies announced new storage plant combinations: batteries with solar and wind power to provide consistent electricity in Australia, and a hydropower plant-plus-storage to tap the challenging PJM frequency regulation market. The onus is on the developers to prove these newfangled plants can make money, but they've already expanded the range of uses for grid storage technology. Wind and solar and storage, oh my! Windlab and Vestas will develop a solar-plus-wind-plus-storage project in Queensland, Australia called the Kennedy Energy Park by the end of 2018. This will include 43.2 megawatts of wind capacity, 15 megawatts of solar and 2 megawatts of storage. That's the first system of its kind that's been publicly announced, said Hong Durandal, a business analyst covering hybrid systems at MAKE. Perhaps the closest antecedent is a system built last year by Spanish turbine maker Gamesa that combines solar, wind and batteries with diesel generators. * That system is much smaller and operates off-grid, so it serves a different market. At the Queensland project, a single control system will operate all three resources, to optimize energy production and availability. Vestas will provide a 15-year active output management service for the site. "By pairing two different generating assets such as solar and wind with energy storage, the system is more reliable and flexible than individual standalone solutions," Durandal said. "A wind-solar-battery system is more resilient against unforeseeable circumstances such as prolonged cloudy days with poor sunlight or days with low wind speeds." In addition to meeting strict energy generation requirements, the plant will be able to provide grid services like frequency regulation, energy-shifting, peak load reduction and ramping, he added. Australia draws almost all of its electricity production from fossil fuels; coal dominates with 63 percent of generation. Wind and solar produce a small but growing share of generation. The government has a target of 23.5 percent renewable energy by 2020. "Kennedy Energy Park represents a new milestone for wind turbine OEMs stepping into hybrid energy projects to diversify and continue to grow the wind industry," Durandal said. If this type of project grows into a trend, it poses a challenge of nomenclature. A five-word hyphenation doesn't bode well for branding efforts. Durandal uses the term "triple hybrid." "Hybrid" often connotes two elements, as with a Prius, but it isn't limited to that. Greensmith (now a subsidiary of Wartsila) will work with American Electric Power to connect 4 megawatts and 4 megawatt-hours of battery storage with the Buck and Byllesby hydroelectric plants on the New River in southwest Virginia. The new batteries will help the hydro plants, which have operated since 1912, compete more nimbly in today's market. Pumped hydro stores far more energy on the grid than batteries do, but that's not what this is. In fact, this appears to be the first time a developer will pair hydro generation with battery storage. The companies expect the system to begin operations in Q1 2018. At that point, the batteries will improve the plant's performance enough to qualify for both of PJM's frequency regulation markets: "RegA," which is the traditional market, plus the faster "RegD." "The key is fast response time and accuracy of the battery energy storage relative to the slow response time and accuracy of a hydro dam," said David Miller, Greensmith's director of business development. "Hydro dams have different response times, but the dams in question here are old and therefore do not have a fast response." Greensmith previously developed six grid-scale energy storage systems in PJM territory, but this is its first since the regional transmission operator implemented new frequency regulation signals and requirements. That change undercut the payback opportunities for storage, as detailed in a recent episode of The Interchange podcast. "With all of these changes, the PJM market is effectively closed to new capacity due to merchant risk, and revenues took a nosedive," said Ravi Manghani, energy storage director at GTM Research. The decision to combine hydro plants with storage could sidestep that problem. Battery systems usually play in the RegD market, due to their energy capacity limitations, Miller said. The fast-response storage will allow the hybrid plant to compete there, but it also wields the energy capacity of the hydro plants, opening up RegA revenue. That serves as a hedge in case RegD prices drop further. "The hedge helps to secure the business case for battery storage," he said. In practical terms, the hydro plants and lithium-ion batteries will run simultaneously. The hydropower sells energy and keeps the batteries charged up while the battery does the fast response work required by PJM's frequency regulation market. In return for the top-up, the battery minimizes wear and tear on the dam from fast-ramping. That's quite similar to GE's calculus for pairing batteries with gas peakers: save the generator from start-stop operation, allowing it to run in more favorable conditions, ultimately prolonging its life. This means that, for the cost of adding 4 megawatts, the century-old facility gets a whole new revenue stream. "It's almost like adding a Ludicrous mode to a horse buggy," Manghani said. Storage continues to bolster its reputation as the most versatile technology on the grid. More hybridization of storage with any type of generation is on its way, Miller said. "By combining generation with storage, we can take advantage of the beneficial performance characteristics -- fast response, fast ramp rate, low O&M costs, zero emissions -- while using the generation asset to address the constraint posed by storage’s limited energy duration," he said. Frequency support and spinning reserve applications make the most sense for hybrid plants currently, in both electricity markets and remote grid environments globally, Miller added. Greensmith already pairs batteries with a Wartsila engine, and likely will integrate more generation assets in the future. *Updated with information on a similar hybrid system.